We didn't do anything particular on the Christmas, just enjoyed the days off. Timo had 2 extra days off and Nancy only one. Nancy was working on Christmas day arranging a little Christmas party for her "consumers" (of the public mental health services where she's working). On Christmas day we spotted this cute green tree frog next to our duck pond. 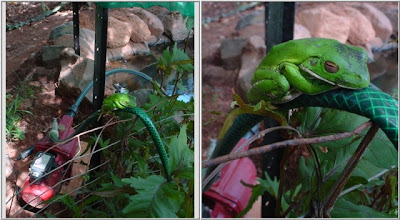 It was sleeping on the hose of the pump. Earlier this month we had heard a male frog mating on the mango tree. Big thing of December was our new fence. 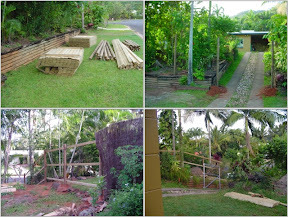 We had tried to get someone to do it already since August but all tradesmen are still extremely busy rebuilding Innisfail and other areas damaged after the cyclone Larry on March 20th 2006. This Luke we got from the local free newspaper. We had to try him even though I thought there must be something wrong with those that need to advertise on them. In the end we were right. 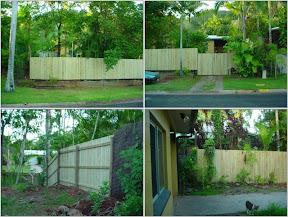 Even though we got 45 metres of well done 180 cm high treated timber fence with a gate, the price was way too high. The guy simply cheated us and made use of our ignorance in the process. That said without further details. In the future we better do something based only on strict written contracts.